Why Does Grout Become Discolored? Most homeowners endeavor to keep their floors and tiled surfaces as clean as possible. However, over time many people become dismayed when their grout winds up discolored. Even if you are an excellent housekeeper and work hard to keep your tiled surfaces impeccably clean, you may find it is impossible to keep your grout looking like new. Why exactly does your grout become discolored when the rest of your floors or shower walls look sparkly clean? The reason has to do with the properties of grout and what happens over time when liquids come into contact with your grout. Here at H2O Barrier Technologies, we developed a grout additive called AquaTight that resolves this issue. 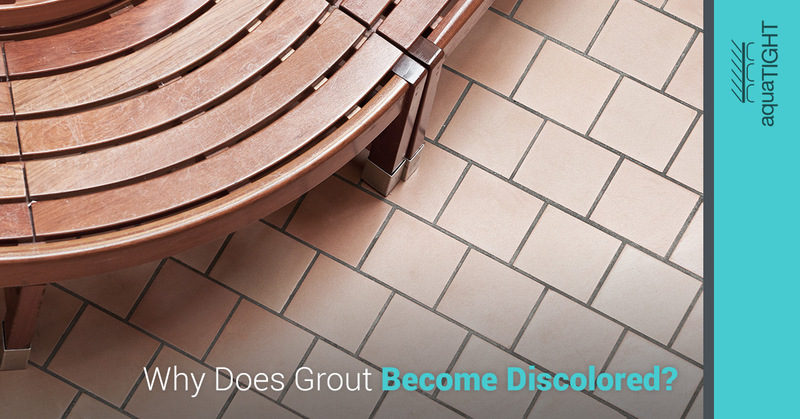 To understand why this grout additive is so instrumental in keeping grout from discoloration, you must first understand why simple grout falls prey to unsightly stains. Read on to learn how stain proof grout could be the solution you are seeking. The reality is even high-quality grout is a porous material. This means that, unlike the tile surrounding it, grout is prone to allowing water and other fluids to permeate its surface. When water or other liquids rest on your grout, they slowly seep into the grout itself. The porous nature of grout then absorbs the coloration of whatever liquid is permeating your grout. Clean water can eventually evaporate back through the porous material, but depending on the climate you live in, mold or mildew could form in the meantime. One solution to this problem historically has been to apply a grout sealer. The disadvantages of a grout sealer is that they often leave behind hard-to-remove films and often cause trapped water in your grout to be trapped forever, incapable of evaporating. This can worsen mold and mildew problems without the grout itself. If your grout is changing color over time, it is likely due to either the liquids that have permeated the grout or the formation of mold and mildew. Mold and mildew form due to a lack of ventilation in an area that is exposed to water. This can also be a common problem in humid areas. The problem is once mildew starts to form it will spread rapidly. Common areas that fall prey to mold and mildew are humid areas in your home like bathrooms and basements. Although improving ventilation can help, it is difficult to combat the formation of mold and mildew without a proper grout additive or sealant. You should never leave mold and mildew growth unchecked. Mold, in particular, can pose serious health risks and will affect your indoor air quality. Your grout may change color due to stains forming inside of the grout material. This is usually due to liquids that are frequently spilled on the grout. The most common areas in your home where grout may face this issue include kitchen floors, entranceway flooring, and tiled countertops. No matter how well you mop your floor or how often you clean off your countertop, once stains begin forming it is difficult to undue. If you spill wine or spaghetti sauce on your kitchen floor, you may face discolored grouting. If you have grout in your shower, you most likely know the struggle of soap scum build up. Not only can soap scum create a film on your tiles, it can also build up in your grout. This effect is even greater if you have hard water with high mineral content. The mineral deposits and soap together can permeate your grout and create unsightly coloring. If you are looking for an alternative to discolored grout, we have designed a product that works to fight against the porous nature of grout. 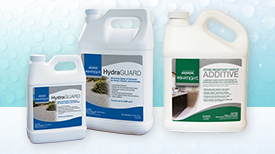 Our product aquaTIGHT® creates a hydrophobic surface for your grout. This will repel water and liquids, which shields your surfaces and prevents water sorption. However, the difference with aquaTIGHT® is that it still allows trapped water to escape, which can help reduce the risk for mold and mildew growth. aquaTIGHT® is not a polymer film like some products on the market, which means it is actually resistant to abrasion and can withstand common household cleaners. Interested in learning more? 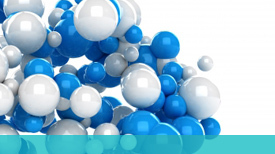 Check out our page on How aquaTIGHT® Works.